EPC Group’s Office 365 roadmap development services focus on all facets and elements of your organization’s implementation to ensure its success. From the very beginning, we focus on addressing mobility, scalability, compliance and governance in your organization’s SharePoint 2019, Office 365 and/or SharePoint Online initiative. SharePoint 2019 and/or Office 365 will more than likely grow in content and user requests at a much faster pace than planned. It is critical to have your support model and defined processes in place for managing end-user requests in the early stages of your SharePoint initiative. By thinking in terms of SharePoint as a Service (SPaaS) or SharePoint as a Platform (SPaaP) that will grow in size and importance over time, will help instill the strategy of SharePoint offering “services” to your organization and will open up the Hybrid SharePoint \ Office 365 implementation mindset. 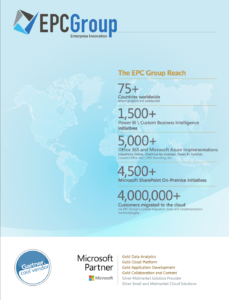 EPC Group’s Office 365 roadmap implementation strategy is forward thinking and addresses possible future needs that your organization may uncover. These initial questions help us set the stage around developing an Office 365 roadmap and/or SharePoint 2019 roadmap to meet your goals. What technologies is the organization currently using? If SharePoint is not currently utilized, what other technologies or line-of-business (LOB) systems are you trying to move away from in going to SharePoint 2019? What is the organization’s stance on the cloud and will you possibly be implementing only Office 365 or both SharePoint Server 2019 on-premises as well as Office 365? What are the initial goals you are trying to accomplish by implementing SharePoint 2019 and what are some other functionalities or offerings that SharePoint 2019 brings to the table that you see possibly being utilized in the future? Intranet and\or collaboration platform for the organization? Collaboration service for departments or team members to work together on to increase productivity? A business intelligence (BI) or reporting service to offer things like dashboards, KPIs and scorecards? Workflow service or business process automation platform to help take existing paper-based processes and turn them into online forms with specific workflows? An extranet that will allow your company to work more collaboratively with external partners, customers or other approved audiences? Central platform to house or host your organization’s existing applications or custom applications? Mobile or “edge device” type service to answer the BYOD questions? Replacement of an existing system like Documentum, LiveLink, eRoom, ApplicationXtender, SAP, FileNet, DocuWare, eDocs etc. Learning Management Service (LMS) or training platform to reduce travel costs of staff or to provide a central location to increase or streamline organizational training needs? Platform to allow you to migrate your existing network file share content to increase security as well as putting structure around currently unstructured content? What does your organization’s currently Active Directory (AD) infrastructure look like and how is it managed? Are there AD groups around specific departments or are there also other custom AD and SharePoint security groups that were created to meet cross-functional projects or user security requirements? What is your current hardware situation and\or strategy? What is your current virtualization strategy? What type of storage are you utilizing and do you have any metrics around content growth? Do you have more than one data center or possibly globally dispersed data centers or DR sites? Are you currently utilizing or planning to utilize cloud-based or SharePoint online / Office 365 solutions? What is the organization’s current mobile or BYOD strategy? What has worked well in the past to train your organization’s staff? Are there content owners or staff members that have been identified as possible SharePoint Power Users? Is the organization looking at the Azure platform or other possible external hosting options like Amazon Web Services (AWS)? Note: These are just a few initial questions but this helps set the stage around developing a SharePoint 2019 roadmap and implementation strategy that is forward thinking and addresses possible future needs. To learn more about EPC Group’s Business Intelligence Consulting Services and Solutions, visit our Business Intelligence offerings page. To kick off the Office 365 roadmap and/or SharePoint development implementation, your goal should be to get as many stakeholders from within your organization as involved as possible. This is especially true for the envisioning and requirements gathering sessions that take place. Inevitably, there will be differing opinions from project team members on things such as the overall site structure, taxonomy, hierarchy, and even the security model around permissions strategies. The SharePoint 2019 and/or Office 365 project will likely be one of the most high profile efforts taking place in the organization and with that there is also the realization that many of the questions that need to answered or tasks that need to be accomplished will be assigned to staff with existing work already scheduled on other efforts and meetings already scheduled on their calendar. This is an area where setting the initial tone of what is expected from the project team by its key stakeholders or project sponsor is very important. A SharePoint 2019 effort requires many elements to be done in parallel and if certain questions are not answered or team members are left in limbo about the direction on a specific project task or milestone, it can cause major delays and team member frustrations. There is also an intangible element around the creation of a SharePoint 2019 cultural adoption and change management strategy as part of the overall project effort that will drastically increase user buy-in on both the initial and long-term usage of SharePoint. Power users, sometimes referred to as super users, tend to not be included in initial SharePoint 2019 design sessions which is a mistake. Identifying staff members who are excited about technology and are willing to be SharePoint Power Users will provide a return on investment (ROI) in three or four major areas and the development of a Power User strategy is critical to the long-term success of your SharePoint 2019 and/or Office 365 implementation. Power Users should be given initial training and SharePoint 2019 introductory materials very early on in a SharePoint initiative. These users may not have extensive IT backgrounds but they will be your “first line of defense” for championing SharePoint as well as assisting users in their departments or specified areas by providing answers to initial questions and getting the overall organization comfortable with using this game changing platform. A best practices Power User strategy will not only will reduce the number of SharePoint support calls or Help Desk tickets by up to 50% but will also provide invaluable feedback as well as ideas about “quick wins” that IT may not have even considered. From the very beginning of a SharePoint 2019 initiative, a large amount of SharePoint specific technical terms will be used and with the wide array of team members from different departments attending specific meetings, it is extremely important to set up a SharePoint 2019 introductory training site. Having a video library available for project members to access with short one to five minute topic-driven SharePoint 2019 videos and as well as a “common set of SharePoint 2019 terms” will ensure every project member is on the same page. SharePoint training sites, frequently asked questions (FAQs) and related materials are typically designed and delivered near the end of a SharePoint project before going live into production. But a scaled down version of these with some core technical overview videos and documents, as described above, should be made available as soon as possible in your initiative. Your project meetings and discussions with team members will be much more productive with a reference or specific example of what you are describing in terms of SharePoint 2019 rather than speaking in terms of an abstract technology. This is something that is guaranteed to kick-start your project and get some real momentum going very early on in your initiative. To learn more about EPC Group’s SharePoint Consulting Services and Solutions, visit our SharePoint Consulting offerings page.